Bliss lets us dismiss the small irritations of life so that we can indulge in the sweet flavor of life’s offerings. Whether you choose Chamomile, Earl Grey, or Chai, fill your cup and fill your day with, love, faith, hope, and joy. Slow and Easy is how your time should be spent at the Barn at Harrisville Inn. Nothing says ‘slow down’ more than an afternoon with a hot cup of tea and some amazing savories, scones and sweets. Tea is one of the most popular beverages in the world, second only to water. More health-conscious Americans are turning to tea, rich in polyphenols, natural plant compounds with potent antibacterial and antiviral properties. The blissful dreams of long ago. If you are exhausted, it will calm you. Afternoon Tea is served in the Barn, to the left of the main entryway. To begin, you will start with a choice of teas, after you’ve enjoyed your first sips of tea, a tiered tray of scones, savory sandwiches, pastries, cakes and fresh fruit complete the experience. Thursday and Saturday from 1:30 p.m. to 4:00 p.m. Some flexibility in the schedule may be requested. Cost: $21.95 per person, plus tax and gratuity. From $25.00 per person, plus tax and gratuity. Make reservation for your group of 6 to 20 people. Plan a lovely outing for a ladies tea party, your book club, church group, bridal or baby shower, friends or business associates. Please let us know if you would like to book the entire room – any day of the week. We’d love to have you! Moms, Grandmothers, sweep your little princess off her feet with a special treat. 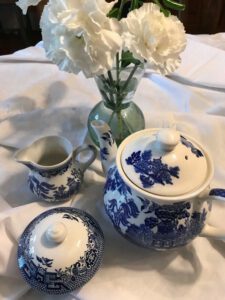 Enjoy an afternoon of tea at the Barn at Harrisville Inn. Parking is available in the overflow lot across the street. Afternoon tea was introduced in England by Anna, the seventh Duchess of Bedford, in the year 1840. The Duchess would become hungry around four o’clock in the afternoon. The evening meal in her household was served fashionably late at eight o’clock, thus leaving a long period of time between lunch and dinner. 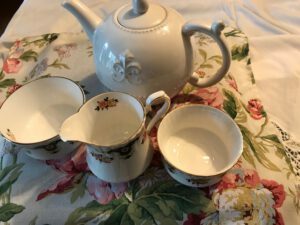 What are the origins of high tea? The British tradition of High Tea began in the mid-1700s as an afternoon meal usually served between 3 and 4 o’clock. Initially, it was a meal for the working man, taken standing up or sitting on tall stools, thus ‘high’. Tea with cakes, scones, even cheese on toast would have been served. According to legend, tea was first discovered by the legendary Chinese emperor and herbalist, Shennong, in 2737 BCE. It is said that the emperor liked his drinking water boiled before he drank it so it would be clean, so that is what his servants did. Who came up with the idea of afternoon tea? 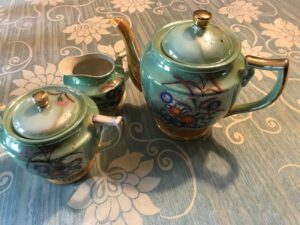 Why do they call it high tea? A possible explanation why this type of meal was called high tea is the fact that it was eaten at a table. In comparison, Afternoon Tea was taken whilst seating in low, comfortable chairs or sofas. Of course, soon after, the upper classes developed their own variation and also called it ‘high tea’. Tea was first introduced to Portuguese priests and merchants in China during the 16th century. Drinking tea became popular in Britain during the 17th century. The British introduced tea production, as well as tea consumption, to India, in order to compete with the Chinese monopoly on tea.